Top Notes: Lemon, Juniper Berries, Myrtle Oil. Heart Notes: Cypress Oil, Pine Needles. Base Notes: Labdanum, Amber, Lentisque. A harmony of sea and land; the fusion of salty sea waves, cool air and beachy woods. 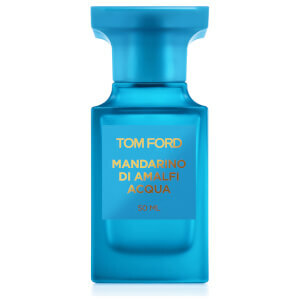 The Tom Ford Costa Azzurra Acqua Eau de Toilette is a refreshing EDT centred round exhilarating accords of citrus, woods and liquid amber facets. Combining refreshing salty waves with the warmth of the sun, the fragrance opens with a ripe splash of Lemon, Juniper and Myrtle before diving into a heart of crisp and earthy Cypress and Pine Needles. The exhilarating scent settles on a rich bed of Labdanum, Amber and Lentisque. Alcohol Denat., Fragrance (Parfum), Water\Aqua\Eau, Limonene, Linalool, Cinnamyl Alcohol, Citral, Alpha-Isomethyl Ionone, Geraniol, Eugenol, Citronellol, Coumarin, Farnesol, Benzyl Benzoate, Isoeugenol, Benzyl Salicylate.